The Nokia 8310 continued and improved on the successful and fashionable Nokia 8210 from 1999. The 8310 is slightly smaller, but feels chunkier. It is also slightly heavier. The 8210 was a ground breaking phone which defined a new market sector for young, affluent and fashion conscious mobile phone users. The 8310 built on this concept. It offered a couple of useful new features: an FM radio and GPRS (General Packet Radio Service). The latter gave a faster connection to internet services and information. What distinguished the 8310 from its predecessors was its customisability. 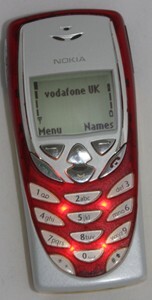 Whilst Nokia phones going back to the 5110 had Xpress-On interchangeable covers, the 8310 had three way customisation. You could replace the top, middle and back of the phone, choosing from a huge colour palette. From the side the phone resembled a block of Neapolitan ice cream. The top cover had a translucent effect and a white backlight illuminated the display when you turned the phone on. You could, of course, mix and match between the official combinations. The Nokia 8310 offered the possibility of individuality, but at the same time following a fashionable in-crowd. In this era Nokia designers fully understood this market. Phones had to be novel and fashionable, as well as light, small and easy to use. The 8310 had new stylishly shaped buttons, a translucent cover and chrome trim. It looked a significant improvement over the 8210 and the technical improvement would be enough to justify upgrading. Most users were on contracts and many contracts gave them a new phone each year. Few forked out the ticket price of £350. Adverts stressed the desirability of the phone. One showed ashamed users of older phones hiding them in their soup bowls in a restaurant. One of the most amusing adverts for the Taiwan market showed a tramp fishing an 8310 out of a bin. Trendy passers by saw the tramp with the phone and decided his ragged look must be at the cutting edge of fashion and imitated his style. Nokia designers also paid attention to the box which had to be part of the package. The image is edgy and stylish, with a hint of Finnish quirkiness. One part of the package though dated the 8310 before it launched, its monochrome display. The Sony-Ericsson T68 already had a colour display and the Nokia 8310 quickly looked old fashioned. I am selling off my mobile phone collection. Offered is the Nokia 8310 on this page complete with original box and instructions. It works with an O2 SIM card. (Charger not included). Offered for £25 + £5 postage to UK addresses only. Read reviews of the Nokia 8310 from 2003 and 2004 - www.mobile-phones-uk.org.uk/nokia-8310.htm . Bear in mind it had been around for a while by then, so there are comments about lack of features. Nokia website from 2001 - Nokia.com - Nokia 8310.